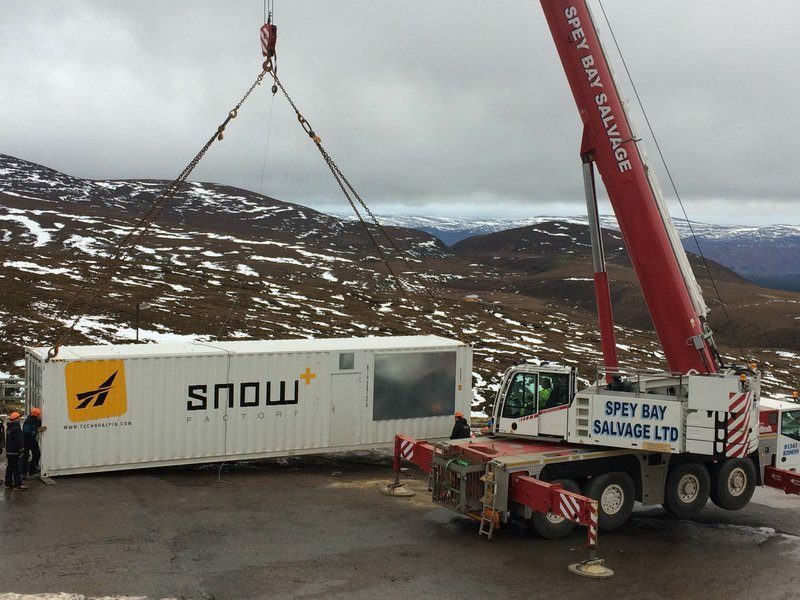 The bulk of a £1m spend on snowmaking at Cairngorm ski area above Aviemore in the Scottish Highlands is being spent on a new Snowfactory all-weather snowmaking unit by industry leaders TechnoAlpin. The remainder of the money is being spent on eight state-of-the-art TR8 fan guns and all are expected to be on site on Tuesday (27 November) next week and should be fully operational within a week of arriving, according to public body Highlands and Islands Enterprise which own the ski area, although it is leased to operator CairnGorm Mountain Limited, and has invested in the new machinery. “The TR8 fan gun sets the bar yet another notch higher in reaching standards of technology never previously attained. The development of new mechanisms of action and the simplification of maintenance mean the TR8 has revolutionized the snowmaking market. 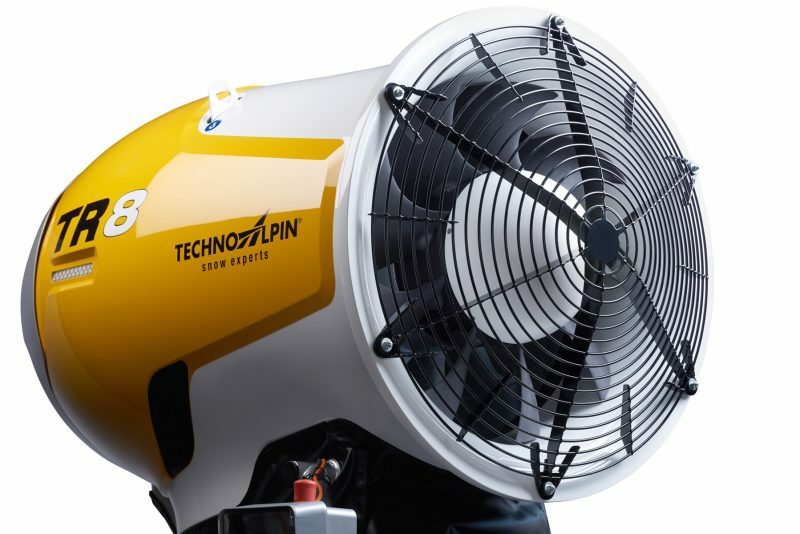 It enables the production of snow of optimum quality in any conditions, thereby guaranteeing supreme efficiency at all levels,” TechnoAlpin’s marketing website explains. Snowfactory all weather snowmakers produce snow within a large articulated unit meaning that snow can be produced whatever the outside temperature. The snow is then spread ready-formed on to surrounding slopes where it thaws if it’s above freezing or doesn’t if it isn’t. Thawing snow cover can be topped up with more snow from the machine. It can cover a limited area but that’s good for beginner slopes and terrain parks for example. Two of the machines were trialled at three ski areas in Scotland last winter, with HIE support. The agency has since helped fund the purchase of machines at The Lecht and Glencoe ski areas where they are now permanently in place following purchase. The picture above shows the unit trialled at Cairngorm last year. The new machine arriving at Cairngorm next week is reported to be twice the size of each of the two existing Scottish machines, with two articulated units to be positioned on top of one another to create an 8m high snow chamber. The investment in snowmaking at Cairngorm has been brought forward in response to operational problems with the funicular railway which accesses the upper part of the ski area but may be out of action this winter due to structural problems uncovered by engineers during a routine inspection. A more detailed report on these issues is expected to be completed within the next three weeks when decisions will be made on the way forward. In the meantime the snowmaking is intended to guarantee snow on the lower beginner slopes, and enable ski tows to take skiers to the upper slopes when conditions there are good.